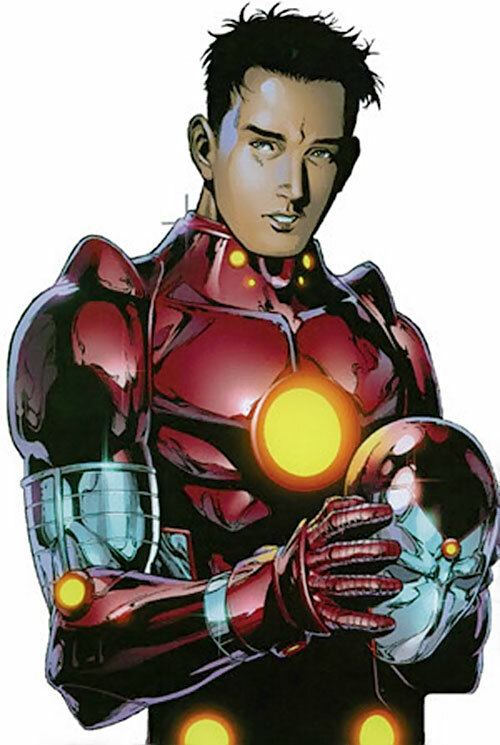 Iron Lad is the seminal character behind Marvel Comics’ Young Avengers team. Though he patterned himself after Iron Man it’s a ruse – there’s no actual link. Iron Lad is actually part of the terrible complicated, time-travel-happy Kang biography. Thankfully, the whole thing doesn’t play much of a role at this stage of the character’s life. Known Relatives: Nathaniel Richards (Ancestor), Reed Richards (Common Ancestry), Victor Von Doom (supposed ancestor), Marcus (future son, deceased); Rama-Tut (alternate dimensional counterparts). Height: 5’9” Weight: 166 lbs. While he has not yet reached the peak of his scientific expertise, Nathaniel has a gifted scientific mind. Change its appearance (which it has done physically and holographically). Fire ion or repulsor beams. Interface with other electronic systems. Open rifts to allow travel through time. 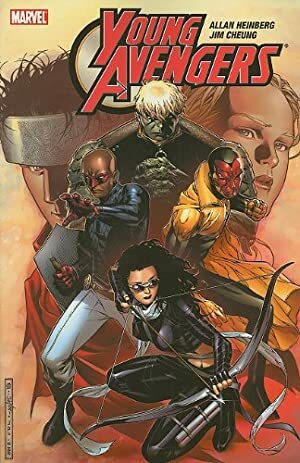 In the year 3016 on the alternate Earth known as Other-Earth, 16-year-old robotics student Nathaniel Richards was rescued from a group of bullies who would have put him in a coma for a few years. 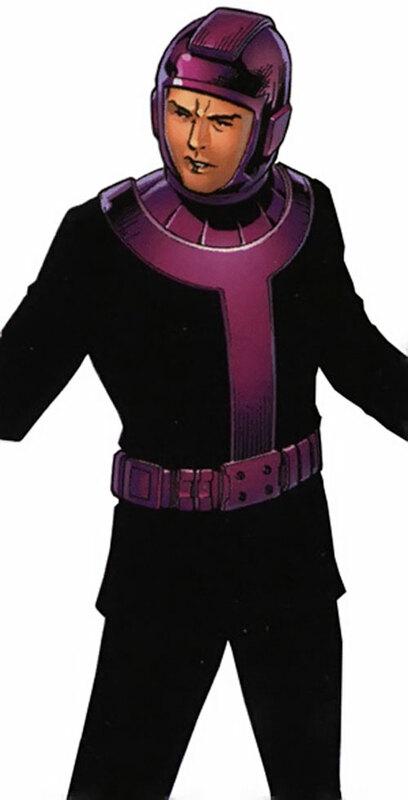 His helper was the time-travelling despot Kang the Conqueror, who revealed himself to be Nathaniel’s future-self. 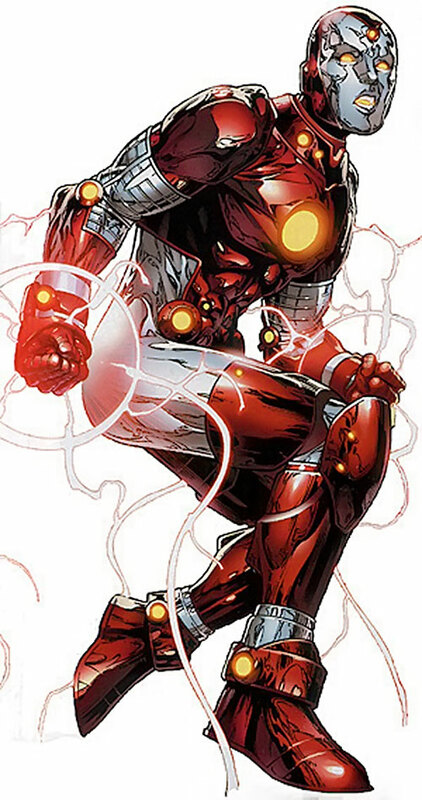 Kang, hoping to change a painful moment in his life, outfitted his younger self with a suit of neurokinetic armour, which gave him a glimpse of his future as a conqueror. Horrified at the death and destruction caused by his future-self, young Nathaniel rejected Kang. He used the armour to escape into the time stream. Returning to modern day Earth (616 reality), he tried contacting the Avengers for help. He discovered them disbanded, their mansion destroyed. He tried contacting individual Avengers with no success. 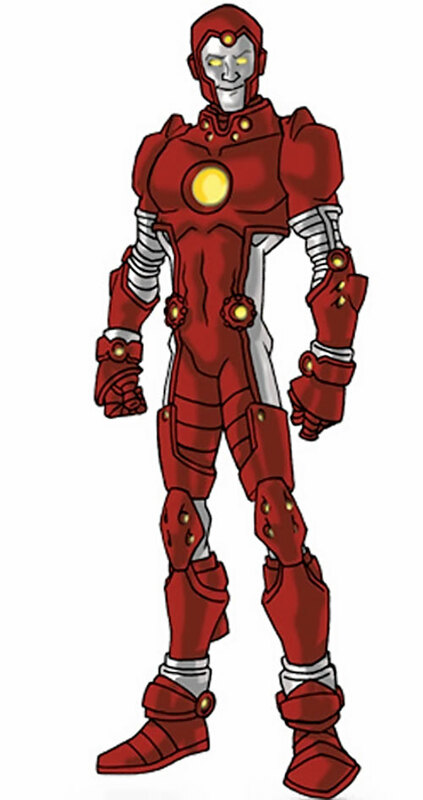 Changing the armour’s appearance, he assumed the name Iron Lad, hoping to throw off any pursuit. 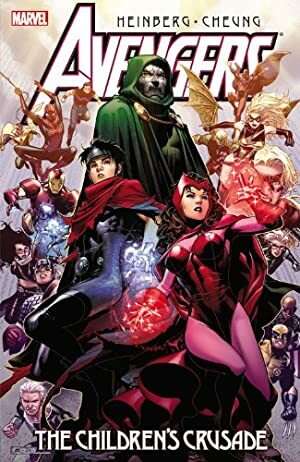 Tracking down the remains of the Vision at a Stark Enterprises warehouse, he accessed it and learnt of the Avengers Failsafe Program, which listed the next wave of young Avengers, super-powered individuals with some link to the Avengers. Using this information, Iron Lad recruited Patriot, Hulkling, and Asgardian, and formed the Young Avengers. When Stature joined, they developed an instant attraction for one another. However it had little time to develop before Kang appeared. When Iron Lad’s presence began disrupting the time stream to such a degree that his teammates started to vanish, he realised he couldn’t stay. 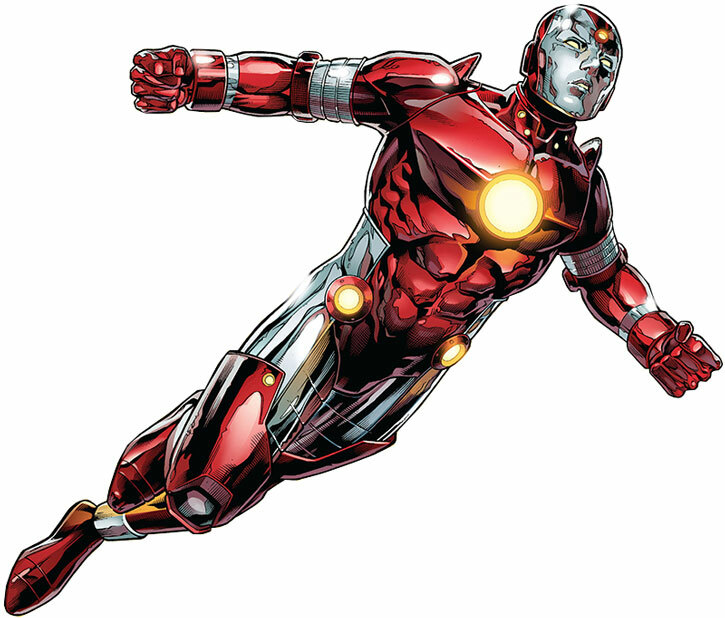 Merging his armour with the remains of Vision’s programming, he had it transform into the new Vision. Then he got it to open him a portal back home. Kissing Cassie (Stature) goodbye, he stepped through the time portal. 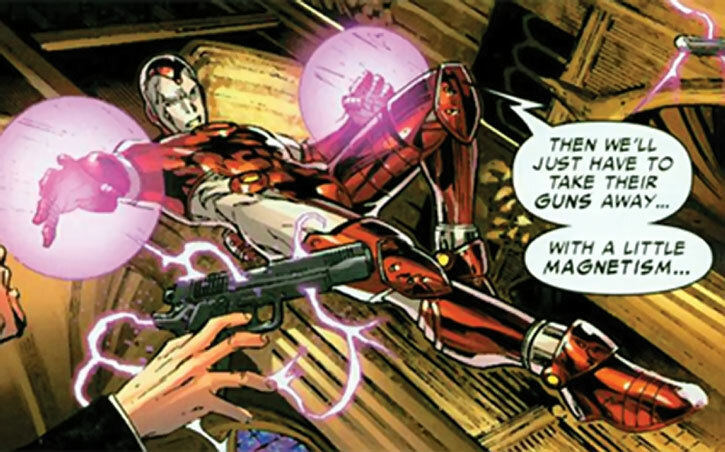 Acquiring, or building, a new set of armour, Iron Lad travelled the time stream opposing Kang wherever he could. One trip brought him up against a Kang allied with the grown-up Young Avengers. 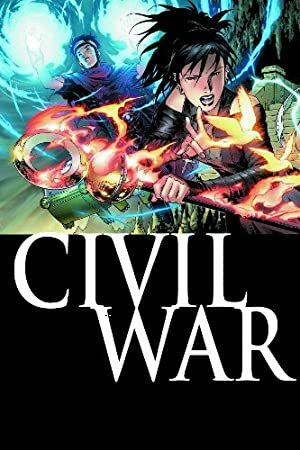 He learned they’d been forced to run from the Avengers following an incident which saw Wiccan and the Scarlet Witch killed. Determined to prevent it, Iron Lad took off into the time stream. While in time to save their lives, his actions saw Scott Lang accidentally saved from death and brought back to the future. The situation continuing to escalate until Cassie was killed by Doom. Distraught, Iron Lad was convinced he could manipulate time to save her. When Vision argued that the danger of making things worse was too great, the grief-stricken Iron Lad lashed out, destroying him. He departed into the time stream, vowing to save Cassie and be better than Kang had ever been. 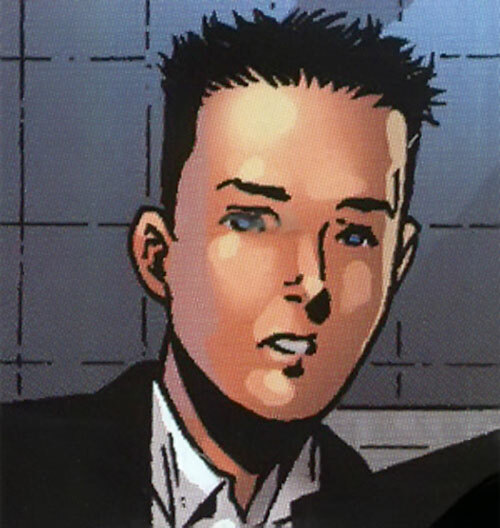 When he returned, Iron Lad was more confident from his time hunting his older self, although some of his confidence in his technology was misplaced. He’d also become less hesitant about manipulating history, seeing it as being for the greater good. He’d basically started down the road to becoming Kang without noticing. ARMOUR [BODY 08, Chameleon: 06, Energy Absorption (Electricity): 08, Energy Blast: 14, Flight: 05, Magnetic Control: 06, Self-Manipulation (Armour only): 08, Time Travel: 33; Drawbacks – Misc. (The armour can be remote controlled by Kang)]. Source of Character: Marvel Comics (covers up to Children’s Crusade #9). Writeup completed on the 26th of August, 2012.